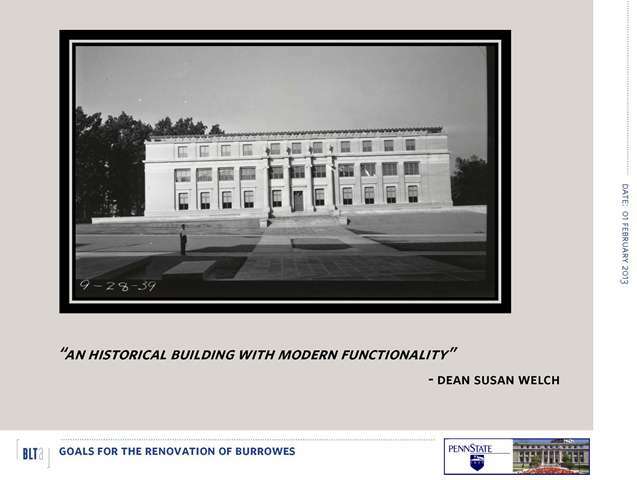 The number one goal of this renovation project is to create a beautiful, historic building that has full, modern functionality. To do this, the project will provide new equipment, it will upgrade the finishes, and it will definitely provide air conditioning and adequate electricity. 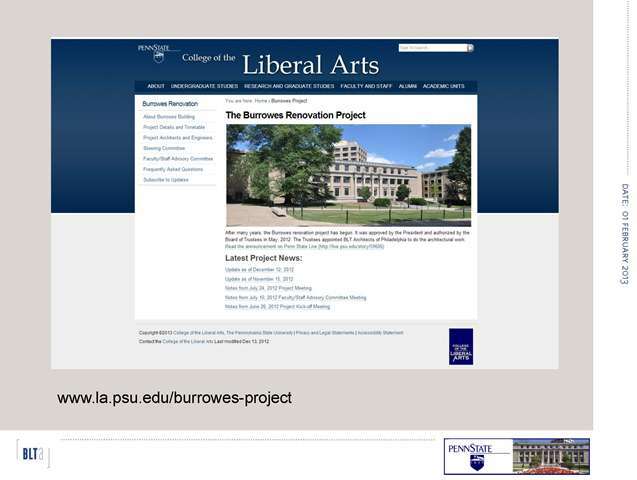 The concept site plan shown above has been approved by the President’s Design Review Board. 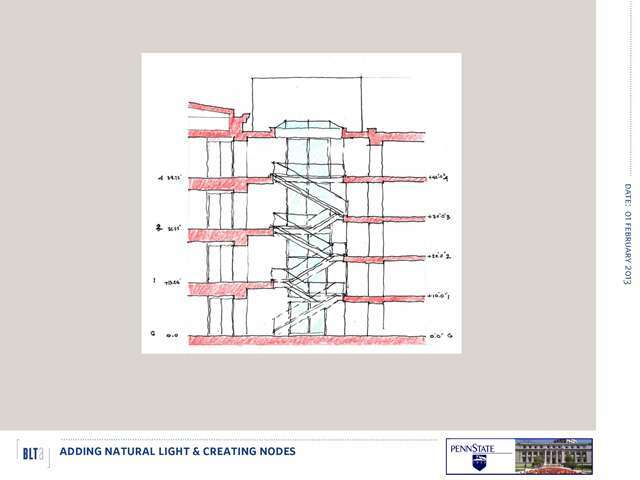 We will be demolishing the existing connecting “knuckles” and rebuilding them to provide the code required accessibility between the various sections of the building, as well as, providing additional natural light and a new face on The Mall. Using the Ground Level as an example, we’ve indicated the primary proposed changes to the building above. First and foremost, the departments will be located in the same general location or level. 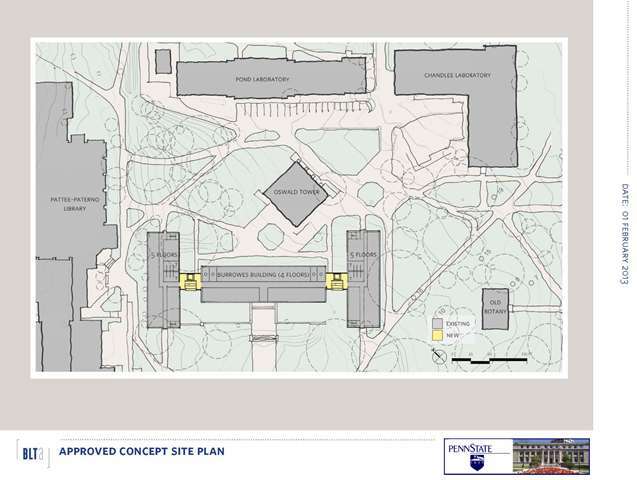 However, the two general classrooms will be located to the Ground Level, which is the most publically accessible level.The connecting “knuckles” will be demolished and rebuilt with code compliant elevators that meet the current gurney requirements.These elevators will open on both sides of the cab – one side at the Wing level and the other side at the Core level. 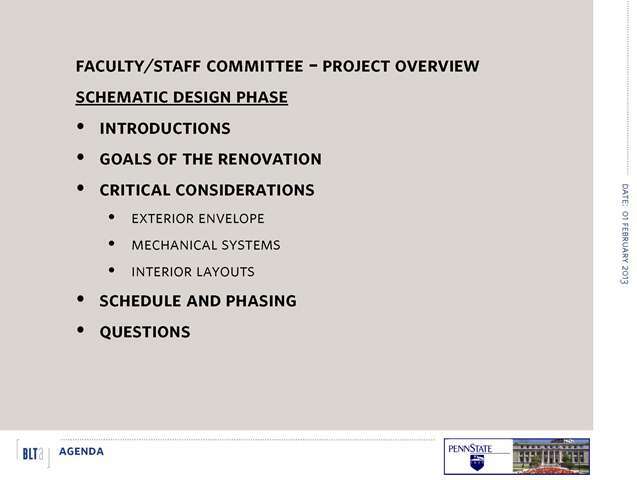 This eliminates the need for the third elevator that is currently located in the Core and is scheduled to be removed. 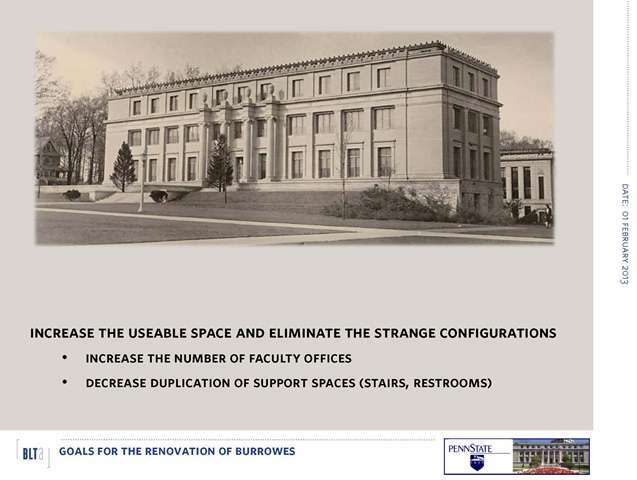 The stairs and restrooms currently located in the Core would also be removed and that space will be reclaimed for other functions. 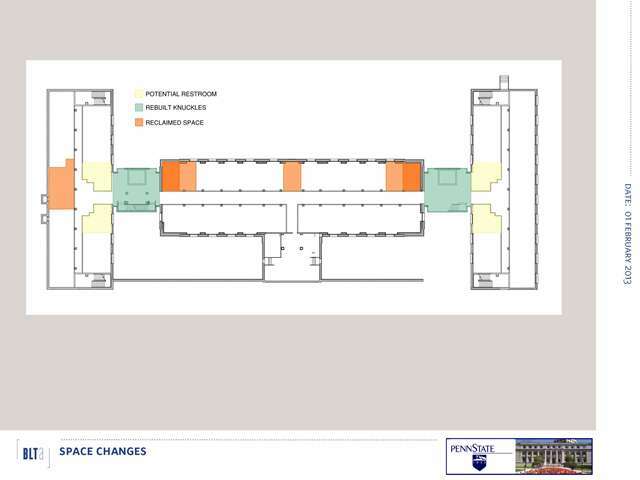 With the loss of the restrooms currently in the connecting “knuckles”, new code compliant restrooms will be located near the new connectors. This image is a section of the interconnecting staircase with a hoped for skylight above. The extent of glass in the wall has been expanded since this image was drawn. The Wing is on the right and the Core is on the left. 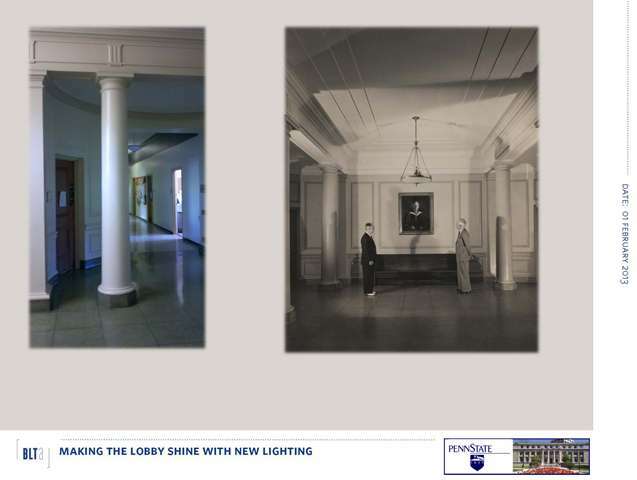 This slide depicts a before and after look at the Entrance Vestibule. This project will spruce up the space and make it shine. We will add new lighting so that it does not seem so dark. 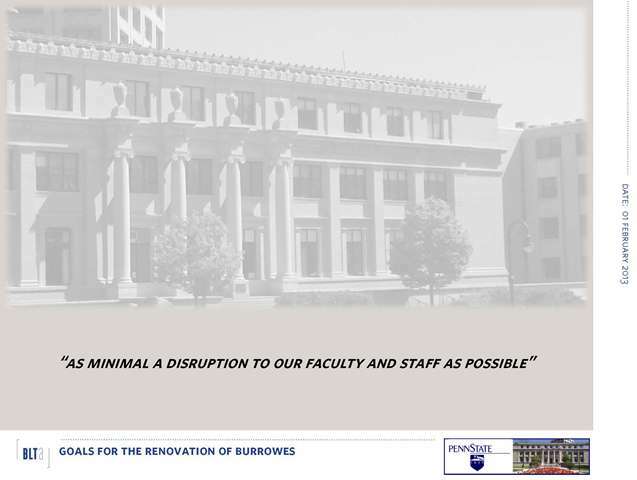 The OPP is working very hard to ensure that this project poses as little disruption as possible; but it is a renovation project, and as such, at some point you will have to move out of your office for a period of time before returning. Schedule – The design schedule has slipped by several months. Our anticipated start of construction is now January 2014; the Spring 2014 schedule of classes should be planned accordingly. Phasing – The current plan is for the North or South Wing and associated knuckle to be Phase 1 to begin in January 2014. Phase 2 would follow about a year later and would encompass the South or North Wing and associated knuckle. About a year later Phase 3 would comprise the Core section. Department heads will work with the College to ensure that relocated faculty will have access to staff support and students will have advising support in the most central available location. Moving out – The schedule of when faculty/staff is expected to be moved out will be announced several months in advance. The College, working with OPP, will assist and organize and OPP will move your office contents to your relocated office. Critter Issue – Since this project is to be phased, an almost-permanent wall will be built at the end of the corridor in the Core to completely separate the area under construction from the areas not under construction. This, and the fact that the connecting portion of building will be demolished, will, hopefully, be enough of a deterrent to discourage the relocation of critters. If not, Chris Hort will address the issue. 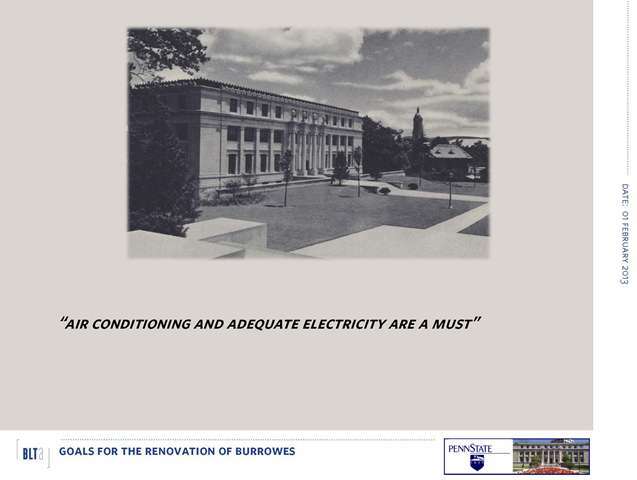 Exterior Disruption – The extensive utility work that needs to happen in the areas around the building will take place during the summer months. 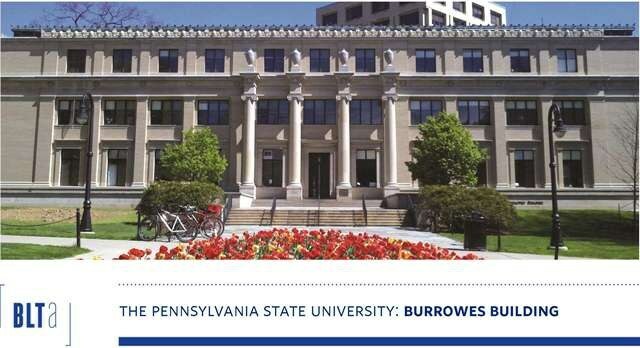 Asbestos Abatement – The University will address any remaining asbestos abatement in the correct manner (e.g. asbestos removal tents) most likely over holidays when the building will not be occupied. Again, the sections of the building will be completely separated from the nearby occupied areas. Solo versus shared staff offices – Final design decisions have not been made about the configuration of staff offices in the renovated building. Just as now, some staff will have individual offices and others will share. 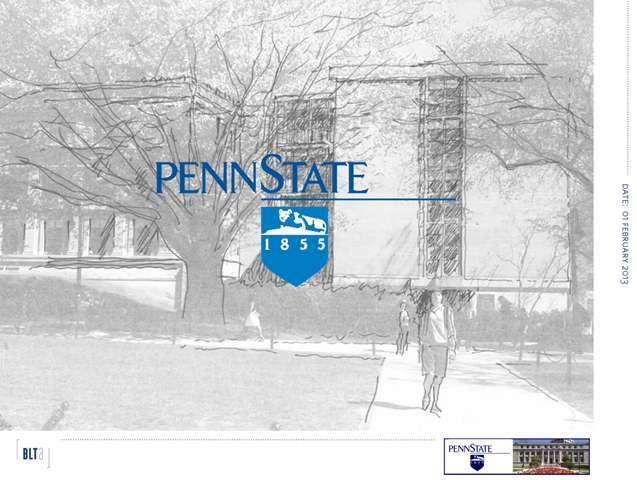 The faculty and staff advisory committee will have an opportunity to review and comment on preliminary plans. For a PDF version of this presentation, click here.